Pro-Globin is the ultimate Blood Tonic. It is a nutritional blend of all-natural vital ingredients, including iron and vitamin B12. It is specially formulated to provide optimal wellbeing and vitality for the modern performance horse. Pro-Globin is an effective feed supplement, recommended for use as a dietary additive during training, racing, pregnancy, nursing and convalescence. Pro-Globin contains scientifically selected natural iron and protein, in a high energy syrup base. Pro-Globin is 100% natural and all the ingredients are sourced and produced in Ireland. 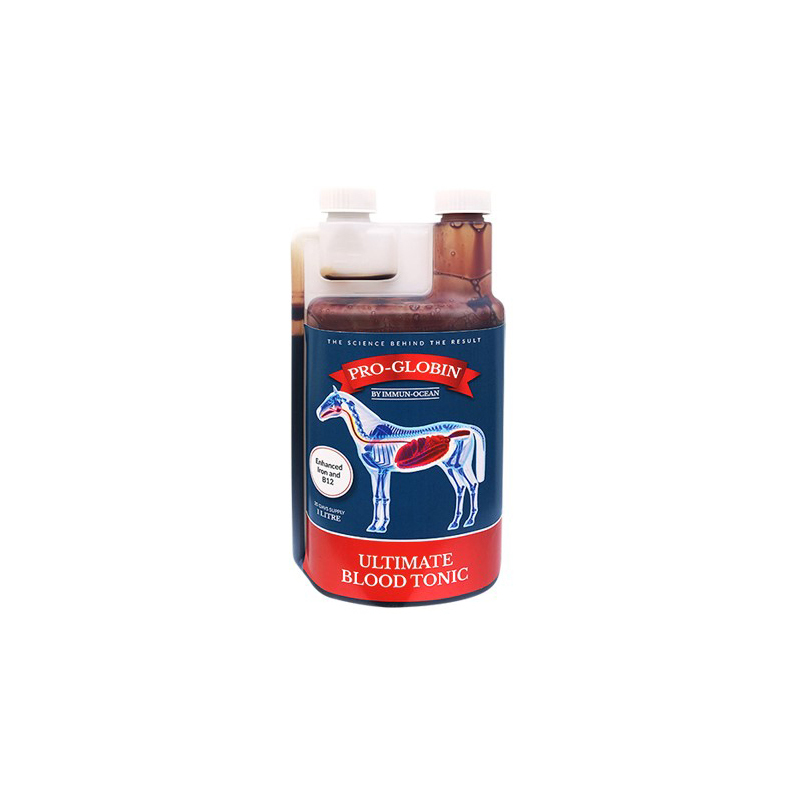 It is most suited to high performance horses, broodmares and convalescing horses. Use in competition horses - We recommend a precautionary 3-day withdrawal period before competing. Available as a liquid and sold in 1 litre bottles. Feeding Instructions: Feed 25mls twice a day for a 20 or 40 day course. Protein 10% w/v, Total Carbohydrates 55% w/v, Iron 25mg/100ml, Calcium 4mg/100ml, Sodium 330mg/100ml, Folic Acid 27mg/100ml, Vitamin B12 480mcg/100ml. Alanine 0.85, Arginine 0.41, Phenylalanine 0.69, Glutamic Acid 0.84, Isoleucine 0.06, Lysine 0.88, Proline 0.32, Threonine 0.34, Tyrosine 0.22, Aspargic 1.14, Cystine 0.07, Glycine 0.46, Histidine 0.71, Leucine 1.31, Methlenine 0.08, Serline 0.42, Trytophane 0.12, Valine 0.95.